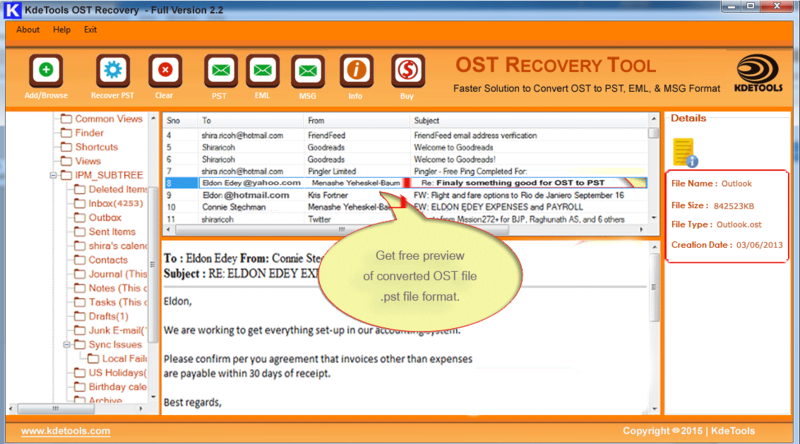 Convert IMAP OST to PST Outlook using one of the best tools available in market like OST Recovery software. This application is trustful software that provides cost effective solution to users. It can effortlessly perform the conversion process from Exchange/Hotmail/Outlook/IMAP OST file to PST file as well as in many formats. This converter uses QDRT techniques by which it effortlessly convert inaccessible OST file into desired file format like EML and MSG. This utility is compatible with all versions of Windows as well as MS Outlook latest version. To avoid OST file corruption issues, it is recommended keeping a regular back of OST (offline storage table) files. It also monitored that while synchronizing OST file with Exchange server you have strong connectivity. So, get the best tool to perform safe and complete conversion.